Your Marketing Plan: Make 2012 a Successful Year! When I was growing up in Connecticut, I would always know when my family was about to take a trip: My dad would announce that he had received the TripTikR. This customized set of maps from AAA, still used today, had been assembled in a package of easily “flipable pages” to guide our auto travel. These maps would keep us on the right road, help us choose excellent stopping points, and help us avoid hazards like road construction and speed traps. To Dad, it was unthinkable to take a long road trip without his TripTik. You business needs a TripTik, too. 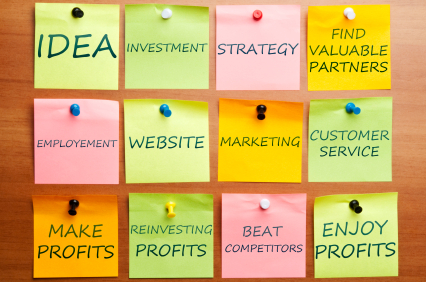 Your thoughtfully prepared marketing plan fills the same function for your business. Just as a TripTik links your starting point with your destination, your marketing plan requires identifying your specific business goals for the year. The process of creating a marketing plan then fills in the blanks by answering these questions: how will you get there? What strategies and techniques will you employ? How will you spend your resources” Who will assist you? If you want to achieve your objectives—and you do!--It is just smart business to invest in your own success by spending giving some time and thought to how your marketing plan for next year will enable you to achieve them. Start by asking and answering questions. Imagine it is Thanksgiving Day 2014. A full 2 years have passed! We’re all a little greyer or a little wider in all the wrong places. We’re going around the table talking about what has gone well and how much we appreciate the breaks we’ve had. When it is your turn, you rise and begin describing the specifics in your life, particularly in your business. How have things improved? What has changed for the good? What new challenges are you convinced you can surmount? Psychologists tell us that we always underestimate how fast things can change and that the more we can use our imagination; the easier it is for us to come up with new ideas. By focusing on a future date that seems far into the future, we allow out imagination to seek out-of-the-box ideas. Yet the reality is that, once unleashed, our businesses are capable of moving quickly to achieve new goals and dreams: A goal for 2014 frequently becomes a plan for 2012. Goals are important, as are the traditional Who, What, When and Where – and “how much” questions. A SWOT (Strengths,Weaknesses, Opportunities, Threats) analysis is always part of the marketing plan that I develop for clients. This is also where competitive research can be helpful. Are other companies serving similar markets or making a similar product? What do their offerings look like? How are they priced? Is their marketing working for them? It used to be very difficult to get this information, but the Internet makes collecting this info easier. What about data that you can’t get on the internet or by interviewing customers? There are still ways to collect and use competitive information that are affordable and practical for small businesses. I recommend the Entrepreneurs Guide to Market Research by Anne Wenzel, which will be available in January 2012. Giving thought to where you want to end up—your business goals—will inform the next steps, which determine how you make your journey – that is, how you execute your marketing plan. Planning obviously involves more than just setting direction. It also is the time to decide to focus on one or more target markets, the strategy to be employed, and the techniques that you will use to carry out that strategy. By “strategies” I mean, given a particular target market, how you will implement your goals. Typical strategies include Thought leadership, Pricing adjustment (Impact Pricing), or service productization. Once you have developed a working strategy, typically it is important to plan for a variety of techniques to realize your goal; these can include trade shows, websites, telemarketing, and email, to name a few. It is important to employ a mix a techniques since not all customers respond well to the same technique . “How Much” can only be answered once you know the “where,” “who,” and “what.” Understanding the value of a new customer and the underlying cost of what you are selling (in labor or materials) will allow you to judge what you should “pay” to acquire a new customer. Finally, it is important to build into your marketing plan certain “check-in” points. These represent opportunities to correct mistakes, revise assumptions, and correct for drift away from your objective. My dad’s TripTik consisted of specific pre-printed pages. Although it, too, is your guide to achieving your business destination, your marketing plan is a living document and will need to change with events that affect your market and the lives your customers are living.